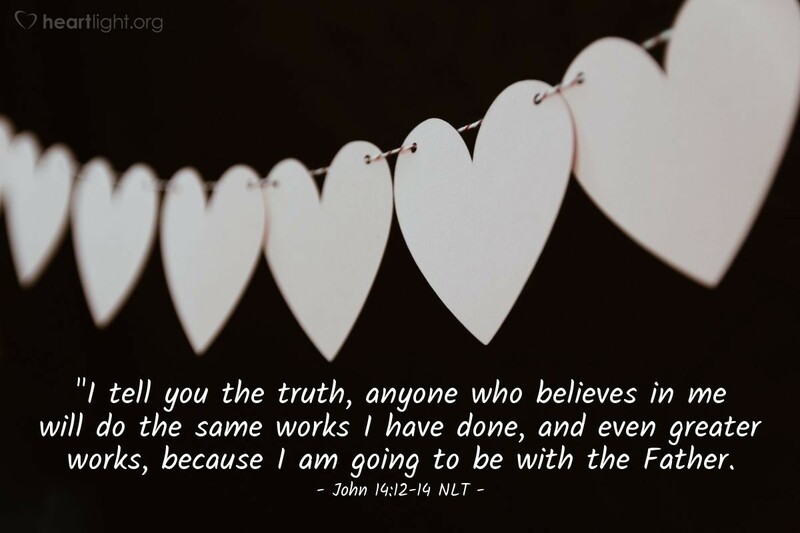 [Jesus said,] "I tell you the truth, anyone who believes in me will do the same works I have done, and even greater works, because I am going to be with the Father. You can ask for anything in my name, and I will do it, so that the Son can bring glory to the Father. Yes, ask me for anything in my name, and I will do it!" Incredible! Jesus promises that his disciples will do even greater works than he did. And they did! And they still do! How is that possible? Jesus is still at work through his disciples. He has specifically told us to use prayer to release his power and bring his blessing. So often we sell ourselves short because we view things from only a fleshly, earthbound perspective. However, when we serve and pray in Jesus' name, incredible things happen! Jesus does greater things through us than we can imagine! Father, I come to you praying in the name and by the authority of your Son, Jesus. I ask that you bless our congregation, and I pray that you use us in mighty ways to bless others to your glory. I pray that you stir your people worldwide so that we will live more passionately for your glory. I pray that you will use me to your glory in ways I never dreamed were possible. Amen.